The National Contact Point (NCP) for Belgium, such as other EMN NCPs, is established and acts according to Council Decision 2008/381/EC. The latter provides that a national contact point, supported by a national network composed of a wide-range of organizations and individuals active in the area of migration and asylum, is designated in each Member State to facilitate the work of the EMN and to ensure the achievement of its objectives. 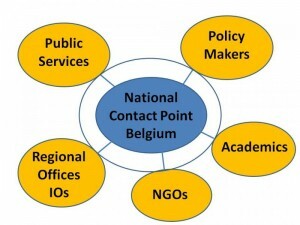 Who is part of the Belgian Contact Point? It is supported by a National Steering Group composed of the directors of the above mentioned institutions. Who is part of the National Network? Each National Contact Point cooperates with a national network, composed of organisations and individuals active in the area of migration and asylum, including, universities, researchers and research organisations, governmental and non-governmental organisations and international organisations to enable all relevant stakeholders to be heard. What does EMN Belgium produce? Other information products, including information leaflets, newsletters, website. How is the National Network involved?